foobar2000 v1.4.3 beta 2 has been released. foobar2000 v1.4.3 beta 1 has been released. This is a maintenanace update addressing known bugs. foobar2000 v1.4.2 final has been released. foobar2000 v1.4.2 beta 2 has been released, with more incremental bug fixes. 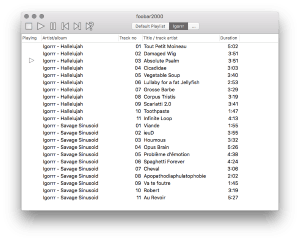 New version of foobar2000 for Mac has been released, with seekbar and bottom playback controls. foobar2000 v1.4.2 beta 1 has been released. This is a maintenanace update focused on addressing known bugs. A major update with new features is being worked on separately. foobar2000 v1.4.1 final has been released. foobar2000 v1.4.1 beta 6 has been released. foobar2000 v1.4.1 beta 5 has been released. The infamous disappearing-window bug with Windows 10 1809 has been worked around. Sadly other Windows 10 1809 issues (font substitution) still persist. foobar2000 v1.4.1 beta 3 has been released. foobar2000 v1.4.1 beta 2 has been released. foobar2000 v1.4.1 beta 1 has been released. foobar2000 mobile for iOS beta testing program is now open for everyone. You can sign up to become a beta tester here. This is the last beta, and the last moment to report any outstanding issues. Version 1.4 stable will be out early next week. foobar2000 v1.3.19 has been released. This is another no-new-features bug-fixes-only update of the 1.3 series. foobar2000 v1.3.18 has been released. This is a no-new-features bug-fixes-only update of the 1.3 series. foobar2000 mobile v1.1 is available to all iOS and Android users - featuring updated Media Library capabilities, an Equalizer DSP, and finally a sanely working screenflip between playback/browse on iOS. Updated version for Windows Phone 10 / Universal Windows Platform will also be available shortly. foobar2000 v1.4 beta 17 has been released. A maintenance update of the foobar2000 v1.3 series is being prepared. It will not add any functional changes, but address known bugs that have already been fixed in 1.4 series. Version 1.3.18 beta 1 is now available alongside the 1.4 beta. If you've found a bug in it, or you think something else can be improved for the most likely last update of the 1.3 series, please visit the forum thread. In other news, updated Microsoft Store version of foobar2000 now comes with long-awaited third party component support, if running on non-S version of Windows 10.
foobar2000 v1.4 beta 15 has been released. Recent regressions have been fixed. New field has been added to the Default User Interface status bar. Features for version 1.4 have been frozen, there will be no further 1.4 changes other than bug fixes. foobar2000 v1.4 beta 14 has been released. Various bugs reported on the forum have been fixed. The File Operations component has been updated; the presets are now stored in a plain text files that can be edited by hand or backed up. The beta version expiration timeout has been relaxed, the popup is now dismissable but will re-appear on next startup. foobar2000 v1.4 beta 13 has been released. Various minor bugs and regressions reported on the forum have been corrected. foobar2000 v1.4 beta 12 has been released. Support for reading music files from FTP servers has been greatly improved and now covers FTPES/FTPS. Various reported bugs have been addressed. foobar2000 v1.4 beta 11 has been released. Many long time bugs have been addressed; various v1.4 regressions have been fixed as well. foobar2000 is now experimentally available in the Microsoft Store. Note that the Microsoft Store distribution currently does not support loading of additional components; this is being worked on and will be addressed. foobar2000 v1.4 beta 9 has been released. More of beta 7 regressions have been fixed; Media Library search performance has been improved for large libraries. foobar2000 v1.4 beta 8 has been released. Various beta 7 regressions have been fixed. foobar2000 v1.4 beta 7 has been released. This update brings HTTP/FTP networking code from foobar2000 mobile, as well as other major improvements. foobar2000 v1.4 beta 6 has been released. Beta 4 regressions and reported bugs have been fixed. foobar2000 v1.4 beta 4 has been released. New version contains improvements to the ReplayGain Scanner component, as well as fixes for various reported issues. foobar2000 v1.4 beta 3 has been released. Various reported bugs have been fixed; missing screen reader support in new UI parts has been addressed. The foobar2000 Software Development Kit has been updated. You can now make components utilizing v1.4 beta features; the latest version of Microsoft Visual Studio is supported out of the box. foobar2000 v1.4 beta 2 has been released. Various beta 1 bugs have been addressed. foobar2000 v1.4 beta 1 has been released. This is a major feature update, various parts of the user interface and the internals have received a major overhaul. foobar2000 v1.3.17 final has been released. foobar2000 v1.3.17 beta 3 has been released. A minor-tweak-gone-wrong regression with FLAC tagging in beta 2 has been corrected. foobar2000 v1.3.17 beta 1 has been released. Various documented bugs have been fixed. The Windows Phone / Windows Store beta test has been put on hold due to low user count and extra work needed to push betas - slow/buggy toolchain and store website. The latest codebase as of 1.0.83 - with all features enabled - has been pushed to the public version - if you're using the beta channel, we recommend you uninstall it and install the updated public version instead. In other news, the latest update for Android addresses lots of known bugs. If you've had trouble with foobar2000 for Android before, we recommend that try your luck with the latest version. foobar2000 v1.3.16 has been released. Various bugs - including a most horrible Advanced Preferences glitch - have been fixed. Since MP3 patents have expired, Free Encoder Pack now includes an MP3 encoder, LAME. foobar2000 v1.3.15 final has been released. foobar2000 v1.3.15 beta 1 has been released. foobar2000 v1.3.14 beta 1 has been released. Various reported bugs have been fixed; new extended options have been added to the File Operations component. enable foobar2000 v1.3.13 beta 2 has been posted. Various regressions have been fixed. Newly added features include native playback of WavPack 5 DSD files. foobar2000 v1.3.12 final has been released. foobar2000 v1.3.12 beta 4 is available. Well, that was quick. Version 1.3.12 beta 1 is available; regressions from 1.3.11 have been fixed. foobar2000 1.3.11 final has been released. Various bugs and regressions have been fixed; all users are encouraged to update. foobar2000 1.3.11 beta 5 has been released. More of reported bugs have been fixed. foobar2000 1.3.11 beta 4 has been released, fixing dither regression. foobar2000 1.3.11 beta 3 has been released, with more fixes for issues reported on the forums. foobar2000 1.3.11 beta 2 has been released. Two known regressions from the beta 1 have been corrected. foobar2000 1.3.11 beta 1 has been released. foobar2000 mobile free preview has been released - for iOS, Android and Windows 10. For reasons understood only by Microsoft, our digital signature is now rejected by SmartScreen - even though other Windows components show that the file is signed correctly. 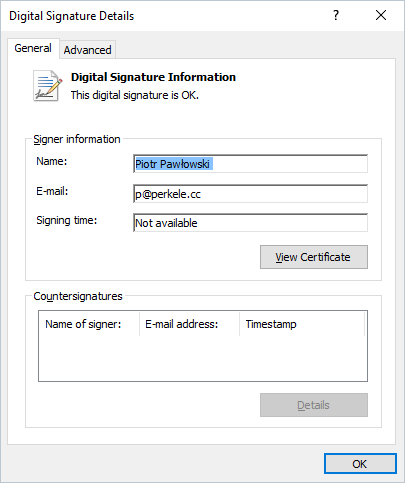 Effective now we quit using digital signatures on our installers. foobar2000 1.3.10 has been released. foobar2000 1.3.10 beta 2 has been released. 1.3.9 and 1.3.10 beta 1 fixes for Windows shell interaction have all been reverted due to unwanted side effects. foobar2000 1.3.10 beta 1 has been released. This is a cumulative update addressing various known bugs reported since the 1.3.9 release, as well as bringing latest and greatest FFmpeg. A stable version will be available shortly. foobar2000 1.3.9 beta 5 has been released. foobar2000 1.3.9 beta 4 has been released. foobar2000 1.3.9 beta 3 has been released. foobar2000 1.3.9 beta 2 has been released. All known issues and regressions have been fixed, thanks to everyone who reported them. foobar2000 1.3.9 beta 1 has been released. New features include a new high quality resampler. foobar2000 SDK has been updated, now compatible with newly released Visual Studio 2015.
foobar2000 v1.3.8 final has been released. foobar2000 v1.3.8 beta 1 has been released. foobar2000 v1.3.7 final has been released. Additionally, a refreshed version of foobar2000 SDK has been released. foobar2000 v1.3.7 beta 1 has been released. foobar2000 v1.3.6 has been released. libFLAC has been updated to v1.3.1, fixing known security vulnerabilities. Everyone is advised to upgrade as soon as possible. Free Encoder Pack has also been updated with latest & greatest FLAC binary. foobar2000 v1.3.5 has been released. A lockup when accessing incomplete multi volume RAR archives has been fixed. foobar2000 v1.3.4 beta 5 has been released. A 1.3.4 regression causing crashes for some people has been fixed. FLAC code has been updated to the latest, with speed and reliability improvements..
foobar2000 v1.3.4 beta 4 has been released. Further RAR related regressions have been addressed. FFmpeg code updated to version 2.4.1.
foobar2000 v1.3.4 beta 3 has been released. RAR handling regressions have been addressed. foobar2000 v1.3.4 beta 1 has been released. foobar2000 v1.3.3 final has been released. The foobar2000 mobile fundraiser is still open to anyone who wants to gain early access. We thank all the contributors; the development will officially begin next week. foobar2000 v1.3.3 beta 3 has been released. Various usability issues with the new Converter additions have been addressed. New release: foobar2000 v1.3.3 beta 2. Free Encoder Pack now includes fhgaacenc. New release: foobar2000 v1.3.3 beta 1. Free Encoder Pack now includes QAAC allowing the new foobar2000 version to use iTunes AAC encoder. foobar2000 SDK has been updated; the new SDK publishes features introduced in foobar2000 version 1.3, as well as adds the ability to add new audio output modes. Free Encoder Pack has been updated with new Opus and Vorbis encoders. Thanks to everyone who has contributed to the foobar2000 mobile fundraiser. Due to the amounts contributed being significantly below our original plan, we decided to let the fundraiser run for another month. We hope we can deliver a better product this way, with features closer to what we originally intended. Stay tuned for further updates. First, a big thank you to everyone who supported the foobar2000 mobile project so far. The foobar2000 mobile entry has been removed from kickstarter.com due to low popularity - only about 0.1% of the visitors actually supporting the project rather than the 1% we were hoping for; at this rate, donations made via kickstarter.com would never reach us as the lowest goal would not be hit. You can still support the project via our page directly - mobile.foobar2000.com. In case the lowest goal isn't met, we'll still try to deliver a product that satisfies all of those who did support us; just with fewer features than we were originally hoping to. 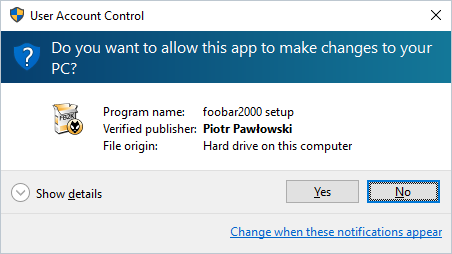 Please keep in mind that foobar2000 has always put its userbase before profit- we've turned down every offer of including ad-ware with the installer so far, and will continue to do so regardless of other factors. A Kickstarter campaign for foobar2000 mobile has been launched! Free Encoder Pack has been updated with Opus 1.1 encoder. foobar2000 v1.3 beta 6 has been released. Bugs fixed: slow startup with unreachable network shares in Media Library folders, configuration save failure when the same folder added to the Media Library more than once. foobar2000 v1.3 beta 5 has been released. More bugs have been fixed; default settings for the large metadata field handling feature have been relaxed; FFmpeg has been updated to the latest version (2.1). Media Library change tracking regression from beta 3 has been corrected. foobar2000 v1.3 beta 3 has been released. Multiple bugs have been fixed, including the infamous Properties dialog crash on internet streams. Additionally, metadata filtering feature introduced in 1.3 beta 1 can now be configured to filter specific fields or behave similarly to old foobar2000 versions. foobar2000 v1.3 beta 2 has been released. Most urgent beta 1 bugs have been fixed, updating is strongly recommended. Free Encoder Pack has been updated with the latest binaries. foobar2000 v1.3 beta 1 has been released. This version focuses on improving performance when dealing with very large music libraries. foobar2000 v1.2.9 has been released. foobar2000 v1.2.8 has been released. Converter regression from 1.2.7 final has been corrected. foobar2000 v1.2.7 final has been released. WAV & AIFF handling compatibility has been again improved. foobar2000 v1.2.6 final has been released. foobar2000 v1.2.6 beta 1 has been released, with tagging related bug fixes and Windows 8 tablet compatibility improvements. foobar2000 v1.2.5 final has been released. New feature: improved usability on Windows 8 touchscreen devices. foobar2000 v1.2.5 beta 3 has been released. More AIFF tagging bugs have been fixed. foobar2000 v1.2.5 beta 2 has been released. Tagging of newly written AIFF files now works every time. As an addition, attached picture handling has been added for AIFF & WAV; Converter can now transfer attached pictures to the newly created file. foobar2000 v1.2.5 beta 1 has been released - with various bug fixes and AIFF tagging support. foobar2000 v1.2.4 final has been released. foobar2000 v1.2.4 beta 3 has been released. Crashes on various old machines have been fixed. foobar2000 v1.2.4 beta 1 has been released, featuring new much faster ReplayGain scanner. foobar2000 v1.2.3 final has been released. foobar2000 v1.2.3 beta 3 has been released. foobar2000 v1.2.3 beta 1 has been released. Various known issues have been fixed. Update: now at beta 2 - Vorbis & AAC bad channel interleaving regression has been corrected. foobar2000 v1.2.2 has been released. foobar2000 v1.2.1 beta 1 released. The new beta version addresses bugs/regressions found in the 1.2 release (currently only one issue). foobar2000 v1.2 beta 2 has been released. Bugs found so far in the previous beta have been fixed (crashes, bad AAC channel order). Additionally, the Free Encoder Pack has just been updated with latest binaries. Decoding of some of audio formats is now powered by FFmpeg. New: UPnP MediaRenderer Output component (separate download, for the new foobar2000 version only).